Choropleths are fancy names for maps with heatmaps, probably because no one wants to say heatmap maps and feel redundant. In R there are packages that make Choropleth objects. choroplethr holds the shape files, create a join of your data frame, and output with colors that you select as continuous or buckets of 2 - 9 categories. When I went to make a choroplethr object, I found that the base state_choropleth( ... ) function did not have the level of customization that I was looking for. Thankfully the package is well documented and I could go directly to the page for the StateChoropleth object and use it's methods to make further modifications! 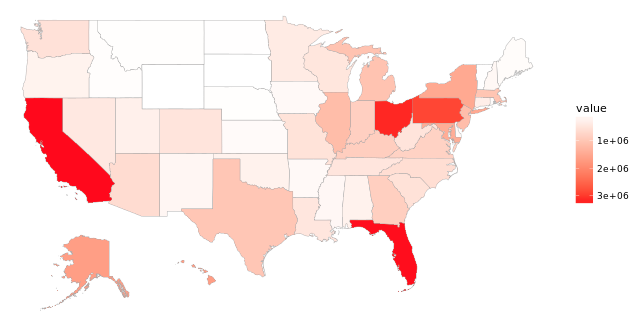 The data frame that you pass into this should be the full state names and the attribute you want to use as the heatmap. My code renames the columns from "state_name" and "attribute" to the appropriate names for the StateChoropleth object.